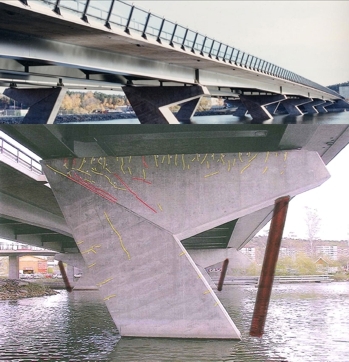 We would like to present one of the analyses carried by our colleague Jukka Ikaheimonen from Ramboll Sweden, the Vårbybridge (road E4 Stockholm). Due to cracking in the columns, strengthening with additional steel columns has been considered (Fig.1). 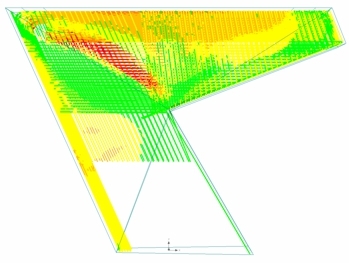 The column has been modelled in ATENA Engineering 3D, reinforcement represented with discrete 1-D bars. 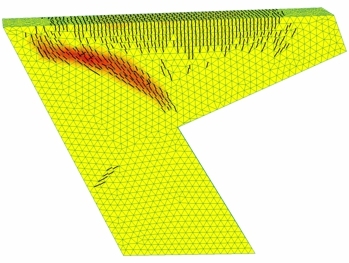 The real crack pattern has been reproduced with the nonlinear analysis (Fig.3), and the results have verified the bearing capacity is adequate (moment capacity in the ultimate stage, shear resistance in the ultimate stage, and fatigue strength of the concrete have been checked). The conclusion: injecting cracks for durability reasons is the only action needed to be taken. Currently, other bridges in Sweden are being analyzed with ATENA by the Ramboll team.